Negative emotions like fear, sadness, and anger are a basic part of life and sometimes we struggle with how to deal with them effectively. It can be tempting to act on what you’re feeling right away, but that often doesn’t fix the situation that caused the emotions. In fact, it may lead to more problems to deal with down the road. Denial is when a person refuses to accept that anything is wrong or that help may be needed. When people deny that they are having problematic feelings, those feelings can bottle-up to a point that a person ends up “exploding” or acting out in a harmful way. Withdrawal is when a person doesn’t want to be around, or participate in activities with other people. This is different than wanting to be alone from time to time, and can be a warning sign of depression. Some people may withdraw because being around others takes too much energy, or they feel overwhelmed. Others may withdraw because they don’t think other people like them or want them to be around. In some cases, people who have behaviors that they are ashamed of may withdraw so other people don’t find out about what they are doing. But withdrawal brings its own problems: extreme loneliness, misunderstanding, anger, and distorted thinking. We need to interact with other people to keep us balanced. Bullying is when a person uses force, threats, or ridicule to show power over others. People typically take part in bullying behavior because they don’t feel good about themselves and making someone else feel bad makes them feel better about themselves or feel less alone. It is harmful to both the bully and the person being bullied and does not address underlying issues. Self-harm can take many forms including: cutting, starving one’s self, binging and purging, or participating in dangerous behavior. Many people self-harm because they feel like it gives them control over emotional pain. While self-harming may bring temporary relief, these behaviors can become addictive and can lead people to be more out of control and in greater pain than ever. Substance use is the use of alcohol and other drugs to make a person feel better or numb about painful situations. Alcohol and drug use can damage the brain, making it need higher amounts of substances to get the same effect. This can make difficult feelings even worse and in some cases, leads to suicidal thoughts or addiction. If you are concerned about your own or someone else’s use of drugs or alcohol, talk to a responsible adult right away to get help. This step is important because instead of acting on feelings right away, you stop yourself and think things through. Count to 100 or say the alphabet backwards. Step 2: Acknowledge what you’re feeling. For example, are you mad at someone, or are you sad because your feelings were hurt by what they did? Whatever it is that you are feeling, it is ok to feel that way. Now that you have taken a few moments to figure out what exactly it is that you are feeling, think about how you can make yourself feel better. Take an action to help yourself based upon what you came up with in the “Think” step. Rip paper into small pieces. Vent. Venting is not the same as asking for help, it's taking an opportunity to share your feelings out loud. We do this naturally when we talk with someone we can trust about whatever is upsetting us. You can also vent by writing a letter to the person who upset you. Keep the letter a couple of days and then tear it up. Stick to pen and paper—using social media when you are highly emotional can be tempting, but you might say something you regret. Make a list of solutions to problems – it can help to brainstorm with a friend of family member. Make a list of your strengths. There are plenty of things about you that are awesome, no matter how down you are feeling at the moment. Do something nice for someone you know. Learn something new – there are tutorials for all kinds of hobbies online. Create - try a craft project, color, paint, or draw. Invite a friend to join you for added fun. Write – you could write a story, a poem, or an entry in a journal. Get active – dancing, running, or playing a sport are some good ways to get moving. Get a plant and start a garden. Practice belly breathing –put one hand on your stomach and start to inhale slowly. As you breathe in, imagine a balloon in your stomach filling up and continue to inhale until the balloon is very full. Put your other hand on your heart, feel your heartbeat, and hold your breath for 5 seconds. Now let your breath out slowly for 10 seconds – feel your belly flatten like a deflating balloon. Repeat this process 4 or 5 times and you should notice your heart beat slow down and your muscles relax. Try progressive muscle relaxation –clench your toes for a count of 5, then relax them for a count of 5, then move to your calves, then your thighs, then your abs, then your arms, then your neck. Go for a walk – feel the ground under your feet and the air on your skin. Focus on your senses. Find a guided meditation on YouTube. Do yoga – you can find videos on demand using your tv or online. Listen to music, a podcast, or an audiobook. Unplug – turn off your phone, tablet, and/or computer for an hour or so. Ask someone to just sit with you. Call a friend you haven’t talked to recently. If you are in crisis, call 1-800-273-TALK or text “MHA” to 741741. If you still feel sad, worried, or scared after trying to help yourself, you might be showing the early warning signs of anxiety or depression. A screening is an anonymous, free, and private way to learn about your mental health and if you are showing warning signs of a mental illness. 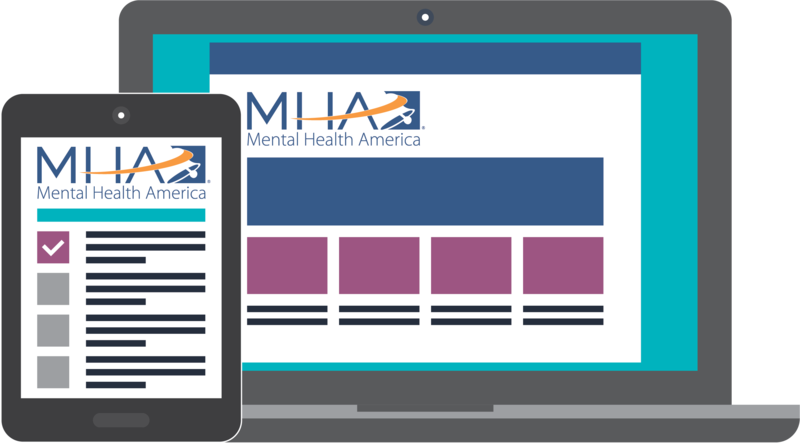 Visit mhascreening.org to take a screen˙it only takes a few minutes, and after you are ÿnished you will be given information about the next steps you should take based on the results. A screening is not a diagnosis, but it can be a helpful tool for starting a conversation with your doctor or a loved one about your mental health. Adapted from Red Flags: Harmful Coping Responses and Coping Responses.